So, did you manage to get your T cast on or do you need some help getting it started? If you are having trouble figuring out the numbers, make sure to post over in the KAL thread so we can get you all sorted out! Before we get too far today, I wanted to share a super easy worksheet I made for you all! Hopefully this will help you keep your numbers in one place, and will help you as you plan out your T. You can download it right here. If you are going to fade, you need to plan for how long and how much. If you are striping, you need to decide how and when, if you are just making it all one nice color, then just keep knitting! 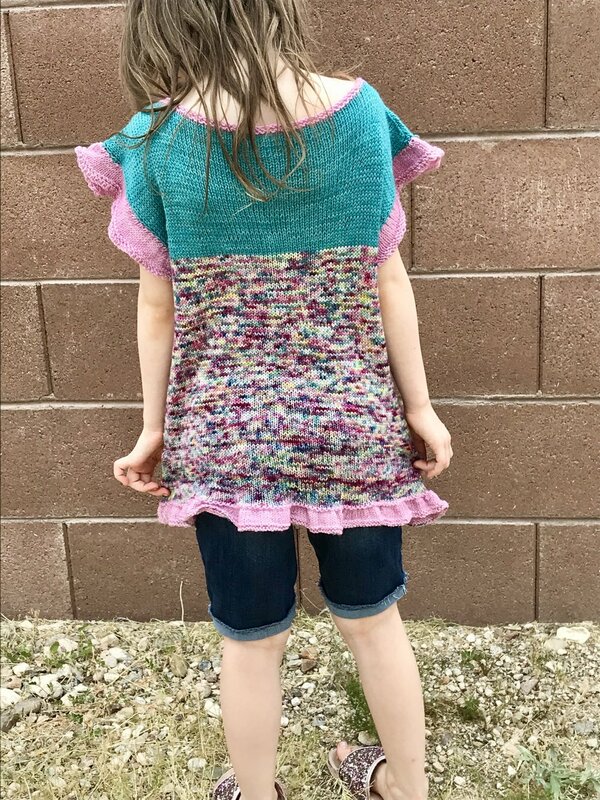 For the faded tee, I worked roughly 4” of each color section, then I worked the color I was knitting with and the next color I wanted to knit with in a stripe pattern where I worked 4 rounds in each color. I figured out my stripe length based on my body length of 18”, and a yoke length of 8”, for a total of 26”, and 4 colors, it worked out roughly to being 4” of each color. You can easily work through this math for yours, take your total tee length (this is the yoke plus the length to the arms), and then divide that by how many colors you are working. Example: for a 3 color fade, you end up with 6 total colors, 1 block of each color by itself (3) and then 1 block for each color to fade into the next (3) for a total of 6 blocks of colors, if you are fading 4 colors, you’ll have 8 blocks of color, does that make sense? And now we keep on knitting! Now you are going to proceed along in the style you prefer (whether that is to fade your colors, work in a single color, stripes, polka dots, whatever strikes YOUR fancy! ), to the length you prefer your top to be from your underarm! So, this is that measurement you took on your shirt from your closet, or that you had someone measure on you, where you want your shirt to fall from your underarm (so don’t measure from the top of your shirt, or from the top of your shoulder, this is just that measurement from your armpit, basically!, you should have written that number down is Step 3, but if not, take a minute to make sure what your body length measurement should be and note it for yourself. And you’ll just keep knitting until your piece reaches this measurement. *Shaping Modification- It wouldn’t be complete without one more option, now would it? My Faded Version is a boxy, roomy, my favorite lounge at home or go catch a movie top. It’s comfy, it’s cozy, but it is not fitted. The Tank version is fitted, and has that A-line shaping to it, as does the children’s top (that one has even more fullness to it’s body). To achieve that shaping, first, remember back in Step One where I told you if you wanted the shape that your cast on measurement would need to be about 10-12 inches more than your target bust circumference? This is where we start to make it fit your bust (so if you didn’t make the cast on measurement more than the bust measurement, here’s where you will want to STOP, and restart!) For the tank version, my cast on edge is roughly 12 inches more than my intended bust measurement, and I wanted it slightly more tunic length, so I have about 20 inches of pure knitting bliss to work away on, which also means that I have 20 inches to decrease my top by 12 inches, with my gauge, I like the way that my decreases look when I decrease every 10 rounds. 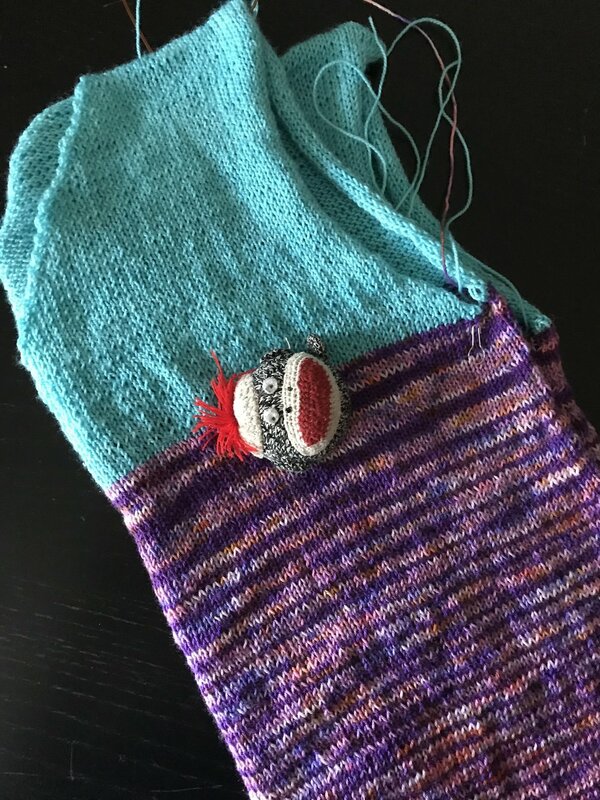 So, to figure it out for yourself, first take your cast on number and divide it by two- then knit that number of sts, place a marker (a different color than your Start of Round Marker), and then knit to the end of the round. Decrease Round: K1, ssk, knit to 3 sts before m, k2tog, k1, sm, k1, ssk, knit to 3 sts before m, k2tog, k1. You have now decreased 4 sts and have started the body shaping.